Dogs make wonderful pets, but dog owners know they are far more than just pets. Unfortunately, if you don't find a dog that fits your lifestyle you may not end up being very happy, especially if you're a first time dog owner. Be sure to steer clear of the worst dog breeds for first time owners. Dogs are special members of our family, and we adore them. They offer friendship, companionship and truly are our best friends. If you’re thinking about becoming a dog owner for the first time, there are many things to consider. Different dog breeds have different temperaments and characters and some may not be suitable for a new dog owner. You'll need to do a little research to find a breed that will meet your needs. If you're looking for an active dog that will go on hikes and adventures with you on the weekend you're probably not going to be happy if you adopt an English Bulldog. You need to select a dog that will fit in with your lifestyle in order to make yourself happy and to provide the best life possible for your new fur-ever friend. Just be sure to steer clear of these worst dog breeds for first time owners. Skye terriers are great little dogs, but they do like to have things their own way and can be really stubborn. This breed of dog does need regular exercise and will require lots of walks to stay fit and happy. They also need regular grooming as their coat can get very long and end up covering their eyes. Skye Terriers will also need regular baths and brushing, as they are prone to matting. They are fairly high maintenance dogs, making them one of the worst dog breeds for first time owners. This breed of dog was originally a watchdog and was used to hunt wild boar in Italy. They are very large dogs and are quite stubborn too. They really can end up ruling the home as they do like to have things their own way. Cane Corsos will build strong bonds with their owners, and they really will become a special friend. They are very territorial dogs and are also extremely protective of their owners. That being said, if you’re a new dog owner, this breed is probably best avoided. This breed of dog really isn’t the best option for a first time dog owner. They are highly athletic and will need a lot of exercise to stay fit and content. They are also very competitive and are known for their endurance. Walkers were originally bred to track and tree raccoons living in the wild. If you lead an active lifestyle, then they may be fine for you, but if not you should definitely avoid this breed. Keep in mind that they will also need a big area outside to run and burn energy. This is not just one of the worst dog breeds for first time owners, but also a terrible choice for city dwellers or folks living in small apartments. They love chasing small game and if you aren’t prepared for this then this breed just isn’t for you. Border Collies are great dogs, and they are working dogs. They are highly energetic and are always willing to please. Border Collies are highly intelligent too, and this breed thrives on human contact. They have a job to do and they do it so well, where would we be without the Border collie? They love having jobs and they are very happy as long as they are pleasing their owners. This breed needs to be mentally and physically challenged and will need a great deal of exercise. If you cannot guarantee that you will be able to provide lots of exercise, then this breed is best avoided. The bloodhound is a lovable dog, and they love their owners. However, they do like being in control and are very stubborn. They have a very strong sense of smell, and if a Bloodhound picks up a scent they want to follow, they will, and you’ll be dragged along behind them. Bloodhounds are prone to chasing other animals, so if you’re a new dog owner, the Bloodhound may be too much to handle. This is a very active breed that needs a lot of stimulation both mentally and physically. They may pick up some naughty behaviors to entertain themselves if they don't get enough interaction, which is why we've added them to the list of the worst dog breeds for first time owners. This breed of dog originates from the Himalayan Mountains and was used to protect families. They were kept inside during the day, but used to be let out at night to protect the families flock and act as a watchdog. 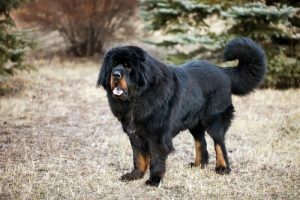 For this reason, Tibetan Mastiffs are an independent breed of dog, and they are also highly intelligent. They can be very aggressive to strangers, due to the fact that they were bred to be watchdogs. This breed will need obedience training, and they will need to be well socialized when they are puppies. This breed is definitely one to avoid if you’re a first time owner. This is a very loyal breed of dog, and their job originally was to herd. They are a very stubborn breed of dog as well. Australian Cattle Dogs can become very restless if they haven’t got a job to be getting on with. They are highly intelligent and are very athletic, so they will need a great amount of exercise in order to keep them happy and stress free. We added them to the list of the worst dog breeds for first time owners because these canines can be very wary of strangers, which could be a problem if you get lots of visitors to your home. This breed will take over, as they do like to have things their own way. The Akita is such a powerful dog, and it originated from Japan. It’s a large dog and is very strong, with strong instincts to guard. Akitas are great as guard dogs, but they do like to be in control and will need a lot of training. Their temperament can also change very quickly – one minute they can be calm and restful and the next minute they can become aggressive. This breed should be carefully watched if you have children or other pets at home. They need to be well socialized when they are puppies to ensure they are used to people and other animals. This breed will require a great amount of commitment and if you cannot guarantee that then this breed should definitely be avoided. This breed of dog is stunning to look at, but they are very big dogs and will need a lot of grooming and exercise to stay fit and healthy. Huskies are working dogs and aren’t happy unless they are out and about exercising. They were bred to pull sleds in snowy climates and are always on the lookout for something to do. A short walk just won’t do with this breed. They can walk for hours and will need a lot of exercise throughout the day. You'll have to have plenty of space for this large breed, and watch out for other pets in the house too. Huskies are predatory dogs and you can never be sure about their temperament from one minute to another, which is why they are one of the worst dog breeds for first time owners. A Rottweiler is a very large dog and for a first time dog owner it’s probably best avoided. To some people they may look like a scary dog, but they can be a loving and affection breed if properly socialized. On the contrary, Rotties also love being in control and can be very stubborn. They can quickly take over if you let them, and they are very powerful dogs. Rottweilers are very protective of their people too. They are so loyal and will be a great guard dog for you and your property if you have experience dealing with this type of dog. They are big though – weighing up to 135 pounds, and a lot of that is muscle. That’s why they are so strong! Next articleDog Trainer’s Salary: How Much Do They Get Paid?